Off the armchair, in front of the gates. West London Rising Up! Off the armchair, in front of the gates. These are interesting times. The establishment is shaken, it’s time to dig deeper and to try out something new! 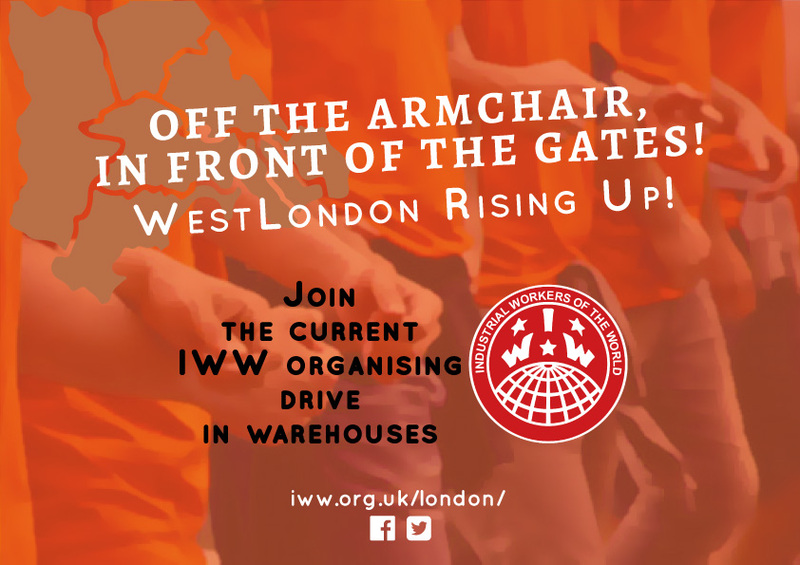 The London IWW invites you to take part in a six month organising drive amongst workers in warehouses and some of the bigger un-unionised workplaces in west London, mainly Greenford and Park Royal. This is a collaborative effort with AngryWorkers, a collective which has been active in the area for over three years. Most are migrant workers, mainly from eastern Europe and the Asian subcontinent. Our organising effort will not only focus on the miserable wages and working conditions, but also on the particular problem of workers as tenants, migrants and women. We will form teams of three, four people for each company, who will then visit workers regularly when the shift starts or ends and build relationships. We will have training sessions and discussions on how to approach workers and about the goals of the organising effort beforehand. The area where we intend to organise is part of the so-called ‘western corridor’, a major logistical and processing hub, where 60% of London’s food is processed, packaged and/or handled. We speak of a large concentration of precarious work in the logistics and food-processing sector – over 100,000 workers keep the city ticking over. Recent warehouse struggles in Italy have shown that individually vulnerable, migrant workers can turn the logistics sector into a collective weapon. There are various ways you can get involved: join an IWW organising team and visit a particular workforce regularly; help with translations, in particular Gujarati, Konkani, Romanian; or help us out with the weekly solidarity network drop-in. Alternatively we are always interested in talking to people who want to set up similar initiatives in other parts of London.